In Luke 10:25–34 we read of a lawyer who sought to challenge Jesus. He asked Jesus what he needed to do to inherit eternal life. Jesus reply is well known to us: You shall love the Lord your God with all your heart, and with all your soul, and with all your strength, and with all your mind; and your neighbour as yourself. The lawyer goes and asks Jesus “who is my neighbour”? Who is my neighbour? Answering that question is what drives us as individuals and a church to live In Mission for Others. We have done that in a variety of ways asking what is God up to in our neighbourhoods. When we look across the ELCIC we can see many different responses to that question. Some congregations have community gardens or collect donations for the food bank. Some sponsor refugees or are involved in environmental issues. Some have built partnerships with Indigenous people. And some have ministries relating to local universities or prisons. The list goes on and on. Our neighbours are not only the people in our immediate community. Our neighbours are all around the globe. We respond to these neighbours in a variety of ways. 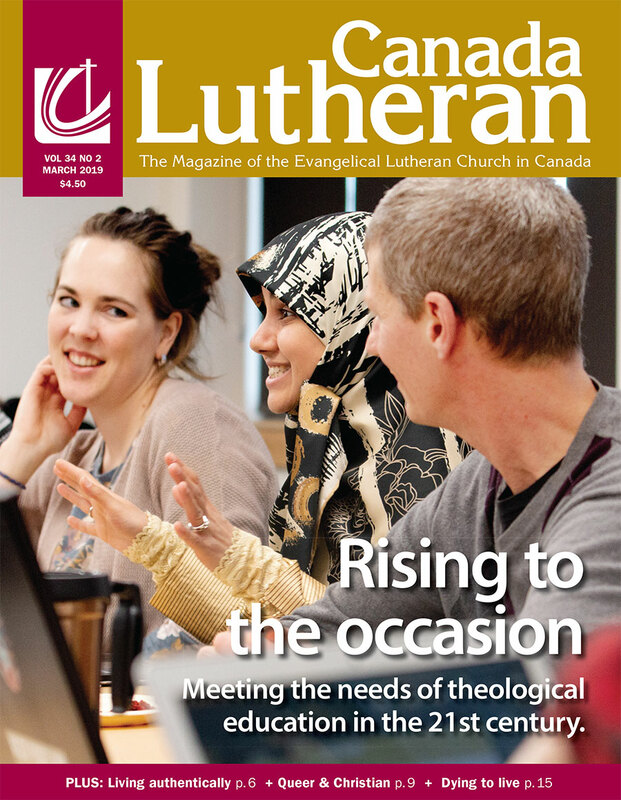 We support and participate in the work of Canadian Lutheran World Relief to challenge the causes and respond to the consequences of human suffering and poverty. We have participated in the Reformation Challenge to raise funds for scholar- ships in the schools of the Evangelical Lutheran Church in Jordan and the Holy Land, plant trees in Palestine and Ethiopia and support The Lutheran World Federation (LWF) Endowment Fund. Our membership in the LWF isn’t just about belonging to an organization. The LWF is a communion of churches. We are part of a global church of 74 million members in 145 member churches and 98 countries. It is both exciting and sometimes overwhelming. It is hard to make all of these neighbours feel real to us. This is one of the many reasons we have bilateral relationships and companion relationships with some of those member churches. What a wonderful opportunity to get to know some parts of the Lutheran communion in a more intentional way. We may even get that chance to visit those churches and develop relationships whether that might mean us travelling to meet them in their churches or having representatives of the churches come to visit on our territory. We include our partners in our prayers and watch attentively when situations develop in their regions, be they elections or weather events or protests. As we develop mutual relationships and learn more about each other, we come to know how we can walk more closely with these neighbours even as they strive to walk more closely with us. Did you know that before and during our recent National Convention I received messages from our partner churches letting me know they were praying for us. That is accompaniment! Some of us focus more on local ministry in our communities, some of us focus more on responding to global needs. But they are all ways of answering God’s call to love our neighbours as ourselves. I invite you to take a few moments and consider, who is your neighbour? Consider what opportunities you might have for building stronger relationships with them and lift them up in your prayers.